So keeping up with the goodies, one of the shots that I loved the most of “star wars: the force awakens” shot done by ilm, now I’m doing my take on this one, will keep on doing iterations until I’m happy with it, taking ADVISES from other people to make the best shot possible. So... keeping up with the "How can I do that?" here's a new update on my current project based on "Star Wars: The Force Awakens", shot done by Industrial Light & Magic. Followed feedback that was given to me and after several iterations, I'm starting to be happy with it, still lots to do, but getting there. After a couple of hours setting up the lighting and shaders… Here's one super WIP of the current “How can I do that” shot that I’m recreating!! 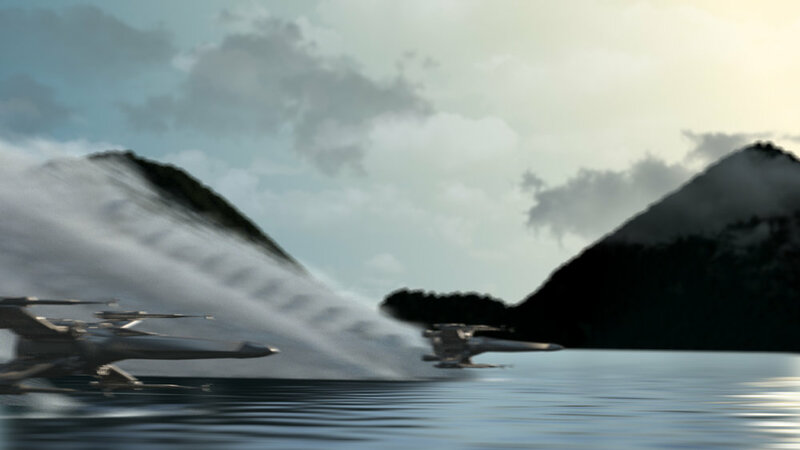 Still lots to do, like textures of the XWings and maybe a better shape of the mountains as. WOOOO!!! One more video, one more WIP, all the simulations are done I like how it looks and now will start with the rendering set up! It was a fun month working in this recreation from this stunning shot done by Industrial Light & Magic for “Star Wars: The force awakens”, in my own deadline was to get as closes as I could to this shot in 1 month or less, and here’s my result. Didn’t liked how the I did the textures and I liked how the XWings look, so I got back to material only. So everything started with this breakdown done by goodbye kansas studio, after saw it I though “can i do that? how?” and the thinking process began and a few hours later I had something that I liked, twicked a little bit more and then I went straight to render it (well i forgot about it for some days), but this is the start of “how can i do that?“. I will spend my free time working on some cool stuff done in movies, series and/or tv ads pushing my learning process farter. Render done with Redshift, textures done with COPS.